FLINT, MI--What started as an event to bring more attention to downtown Flint's oft-overlooked alleys has turned into a staple of summer fun that organizers say will have its biggest year yet. Flint Alley Fest is set for 4 p.m. to 10 p.m. Saturday, July 14 in downtown Flint. The festival, held in Buckham Alley and Brush Alley in downtown Flint, features several stages with live music by local artists as well as art, clothing, and a variety of other vendors, including food trucks. Emily Doerr, a board member for Friends of the Alley, which organizes the event, said she's particularly excited about this year's festival because of some new attractions — in particular an area for kids. "It's the same awesome Alley Fest," she said, "but we wanted to make sure it was family-friendly." At Brush Park, located on First Street next to Brush Alley, there will be a bounce house and other activities set up for kids, including an exhibit set up by the Flint Children's museum. A local animal shelter will also have pets for kids to see and (parents permitting) adopt. Also new to the festival this year is an area on Second Street by Rotary Park dedicated to fashion, as well as a glass-blowing demonstration put on by the Flint Institute of Arts. 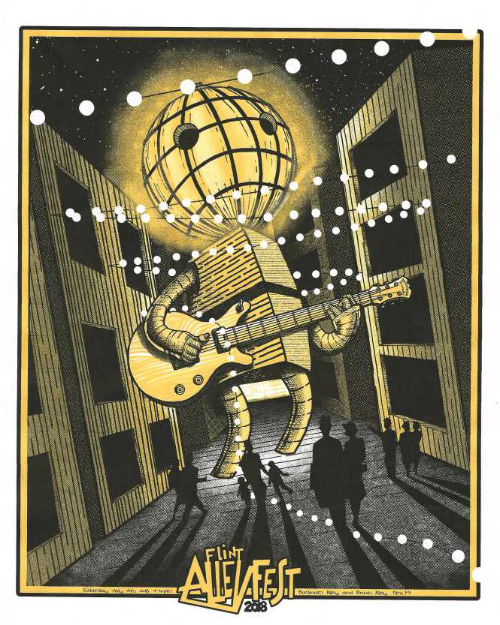 The 2018 Alley Fest poster. Available for $20 featuring a design by local artist Matt Osmond, there are 75 posters available. Doerr said the fashion area will feature the designs and work of local designers and clothing-makers, and that models showing off the Flint-made clothing will be walking throughout the festival grounds all day. Two stages will be set up in Buckham Alley and will feature seven different local rock bands. The stage in Brush Alley will feature five local blues, jazz, and acoustic acts as well as a local DJ in between sets. Alley Fest began eight years ago. Back then it was simpy Buckham Alley Fest, before its massive expansion in recent years to include both alleys that run parallel to South Saginaw Street. Since that first year, Friends of the Alley has headed up successful fundraisers to add the now signature string lighting across both Buckham and Brush alleys. Kathleen Gazall, a Friends of the Alley board member, has been involved since its inception. She said she is thrilled at the change the organization and festivals have helped foster downtown. "I'm very excited about where we’ve taken this festival over the last eight years. As downtown grows and new things come to our downtown, Alley Fest has grown as well," she said. Oaklin Mixon is the owner of Goodboy Clothing, a new clothing store downtown with a window that looks out onto the main drag of Saginaw Street but has an entrance in Buckham Alley. He said Alley Fest is a good way for people to realize that there are businesses like his back there. "I think as businesses are being added to the alley, the Alley Fest raises awareness that they’re back there," he said. "It’s something that’s changing, slowly, but people are getting used to it." Mixon said that the alley can offer a special kind of draw to those who know about it. “To some customers it represents that big-city, underground hidden gem, almost like a hidden speakeasy feel,” he said. Parking for Alley Fest is available in the Flat Lot, Rutherford Parking Structure, and normal street parking except for those streets closed for the festival (Saginaw Street between First and Second as well as First and Second Streets between Buckham and Brush alleys). This year, the festival is also introducing the official, limited edition Alley Fest poster. The $20 poster is designed by local artist Matt Osmond and for sale at the Friends of the Alley table by the Flat Lot. This is expected to become an annual artistic celebration of the festival. For more information, check out Alley Fest 2018's Facebook event.